If you’re like most people, chances are you think salt is a bad thing. Dietitians, doctors and health officials across the globe continue to warn people about the dangers of a diet rich in sodium. And for the most part, they’re not wrong. But there are one teeny weeny little details they’ve failed to mention… a detail that can turn something harmful into something so critical for our health that we literally couldn’t live without it. Something that can help regulate hormonal fluctuations, normalize blood sugar, boost digestion, promote sleep and oh so much more. And that teeny weeny detail? Not all salt is bad salt. And one type of salt that’s taking the health world by storm is Himalayan pink salt. In this post, I’ll begin by exploring the many wonderful health benefits of Himalayan pink salt. Then, when you’ve rethought everything you ever knew about salt, we’ll hit the ground running with a seven-day Himalayan pink salt challenge that’ll help you regain your health and unveil some of the amazing ways in which this glorious salt can enrich your life. Grab your grinders, folks; things are about to get salty! It’d be grossly unfair to assume that Himalayan pink salt is just another kind of salt. Unlike conventional salt or the sodium that’s packed into virtually every processed food, Himalayan pink salt is pure and undenatured; the only processing that occurs is breaking it down from the large veins of salt found in the mines at the foot of the Himalayan mountains to the small chunks you’ll find in your supermarket or health food store. And that means that Himalayan salt retains all of its wonderful trace minerals and nutrients, making it far easier for your body to utilize it where it’s needed most. Because Himalayan pink salt is essentially a whole food product, it doesn’t have the same negative effect on our bodies that the nasty cheap table salt does. Himalayan salt helps to boost digestion and ensure the food you’re eating is broken down quickly and efficiently in the digestive tract. As soon as Himalayan salt hits your mouth, it stimulates the salivary glands to produce amylase, a starch-dissolving enzyme that ensures the carb-rich foods you eat don’t hang around like a bad smell. Then, once Himalayan salt reaches the stomach, it stimulates hydrochloric acid, the key mechanism in which your body breaks down all the foods you eat. As I mentioned earlier, Himalayan salt is loaded with trace minerals. One of these, magnesium, is necessary for the breakdown of sugars and starches. Another — manganese — is often used to treat diabetes, as it helps to regulate blood sugar levels. Yet another, called chromium, is required for the management of insulin, and helps with its production. Together, these minerals and many others found in Himalayan pink salt help to promote balanced blood sugar — an important consideration for diabetics and healthy people alike. Constantly suffering from cramps? Himalayan salt can help with that, too. In addition to being dehydrated, muscle cramps usually occur due to deficiencies in certain minerals, including calcium, magnesium, sodium and potassium. It just so happens that Himalayan salt has a decent amount of all these minerals, and because it’s water soluble it feeds your muscles quickly and can keep the cramps at bay… provided you’re also drinking enough water! Being high in magnesium, getting more Himalayan pink salt in your diet can ensure you get a better sleep at night. In a study published in the Journal of Sleep, magnesium treatment was shown to provide significant improvements in sleep quality for patients suffering from restless leg syndrome and periodic limb movements during sleep. Another study found that nightly administration of magnesium improved all markers of sleep quality of people suffering from insomnia. People have been mixing Himalayan salt to prevent dental cavities and promote good oral health for thousands of years. “Sole” which is essentially just a mixture of water and Himalayan salt, can be used as a healthy alternative to conventional toothpastes. When used as part of a regular toothbrushing regime, the potassium in Himalayan salt helps to prevent gums from bleeding, while it’s high concentrations of calcium help to naturally whiten your teeth while you brush. There’s plenty of other amazing health benefits associated with Himalayan pink salt that I haven’t covered, but I’m sure by now you’re rearing to go! So without further ado, let’s explore the many ways in which Himalayan salt can improve your life! Obviously, your first move should be to ditch the nasty processed table salt you have in the kitchen and replace it with Himalayan pink salt. We put Himalayan salt in our salt shakers, in our salt grinders, and even leave a small bowl of granulated Himalayan salt right by the stove, where it can easily be sprinkled into the dishes we cook to make our food not only tastier, but healthier. Don’t be shy with Himalayan salt — put as much of it on your food as you like, as it’s hard for your body to get too much of this wonderful stuff! Struggling to get going in the morning? It could be because you’re simultaneously dehydrated and lacking in trace minerals. Try this: before you go to bed each night, add a teaspoon of Himalayan salt to a large glass of water and stir until the salt dissolves. Place the glass beside your bed, and make a point of drinking it when you first wake in the morning. Not only will this instantly rehydrate you, it’ll replenish the essential minerals in your cells and quickly boost your energy… maybe even helping you to actually enjoy your mornings! If you’ve used a Neti pot in the past, you already know how effectively salt can clear up clogged sinuses and nasal passages. Himalayan salt inhalers are designed for the same reason: to expel harmful bacteria and bind to toxins that can accumulate within the respiratory tract from living in polluted urban environments. The benefits of inhaling Himalayan salt are many, and include improvement in respiratory health and lung capacity, lowered inflammation and relief from symptoms of asthma, allergies, colds and sinus congestion. If you find yourself regularly suffering from any or all of these afflictions, or you live or work in a polluted urban environment, give a Himalayan salt inhaler a go! While store-bought salt inhalers are best, it’s possible to make your own Himalayan salt inhaler without paying a cent. Check out these easy instructions on how to make one, and simply replace the sea salt with Himalayan salt. As I mentioned earlier, brushing with Himalayan pink salt helps to prevent bleeding gums and naturally whiten teeth, while also promoting removal of plaque. There’s another benefit, too: it doesn’t contain any nasty chemicals or artificial ingredients! That makes it far superior to any toothpaste you can buy, in my opinion. 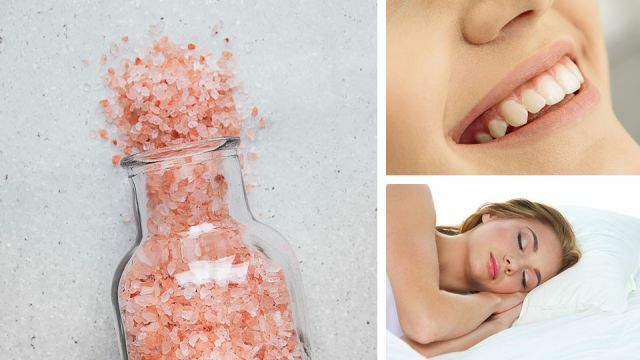 There are two ways you brush your teeth with Himalayan pink salt. The first is by filling a glass jar with 1/4 Himalayan salt and 3/4 filtered water. Give the jar a good shake (it’s now officially “sole”), and leave it in your bathroom, so that when you brush your teeth you can just dip your toothbrush in and get brushing! The other, even easier method is to simply fill a small bowl with granulated Himalayan salt and then, when you’re ready to brush, moisten your toothbrush and simply dip it straight into the salt. Then, go about your brushing as per usual. As I write this article, I’m literally looking directly at one of our prized Himalayan salt lamps. As the late evening shadows move in, the lamp casts a deliciously gentle orange glow around the room, lighting our lounge with warm, living light. But beyond the obvious visual appeal of Himalayan salt lamps (and the fact that they don’t block melatonin production at night), there are some powerful health benefits of lighting your home with Himalayan salt. Himalayan salt lamps are thought to release negative ions into the air, which attract airborne pollutants and bind to them, thereby helping to clean the (surprisingly polluted) air inside your home. They also purportedly boost energy levels, raise levels of serotonin (the “happy hormone”), and are amazingly relaxing. Get your hands on a 100 percent Himalayan pink salt lamp, and start reaping the health rewards. Over the last five days, you’ve eaten it, drank it, inhaled it, brushed your teeth with it and been illuminated by it… why not complete the experience by bathing in it? You’ve probably already heard of bath salts, and possibly even given them a go after a particularly long day skiing or a backbreaking day at work. Soaking in salt and warm water has long valued for centuries as a way to absorb missing minerals and nutrients and rebalance your body’s natural electrolyte levels. Bathing in Himalayan pink salt takes this to the next levels, allowing your skin to absorb essential minerals like magnesium, calcium, iodine, copper, manganese, phosphorus, potassium, selenium and plenty more besides. The beauty of this approach to remineralization is that your skin only absorbs what you actually need, so there are no concerns over getting too much of any one element. Not only that, adding Himalayan salt to your bath turns water a glorious pink-orange hue… and who wouldn’t want to soak in that? Grab yourself a large bag of quick-dissolving Himalayan pink salt, pour anywhere between half a cup and a cup into your bath, and take your bathing to the next level. This is probably my favorite use for Himalayan salt by far. You know all those electrolyte sports drinks that are supposed to rehydrate you faster and boost energy levels? Sure, they might help to rebalance your internal levels of certain electrolytes, but they’re also overflowing with harmful artificial ingredients and toxic byproducts. Plus, they’re actually pretty darn expensive. Here’s a healthier alternative for next time you’re working out: simply fill your drink bottle with water, juice from half a lemon and a teaspoon of Himalayan salt. Loads of trace minerals in the salt will rehydrate you even faster than any conventional sports drink ever could, with the added bonus that there are no nasty ingredients. I call that a win-win! Excited to get started on your Himalayan pink salt challenge? You should be! Not only does this wondrous natural salt make your food taste better, it can also be used in so many different ways and is a critical part of a healthy diet. I can’t get enough of this stuff, and once you start the challenge I’m sure you’ll feel the same! Did I miss anything? What’s your favorite way to use Himalayan pink salt, besides on your food of course? Tell us how the Himalayan pink salt changed your life! Next articleWith New DUI Rules, How Many Drinks Will You Be Able To Have? Hey Buddy!, I found this information for you: "Take This 7-Day Himalayan Salt Challenge For Better Sleep, Digestion And More". Here is the website link: https://www.thealternativedaily.com/7-day-himalayan-salt-challenge-for-better-sleep-and-digestion/. Thank you.